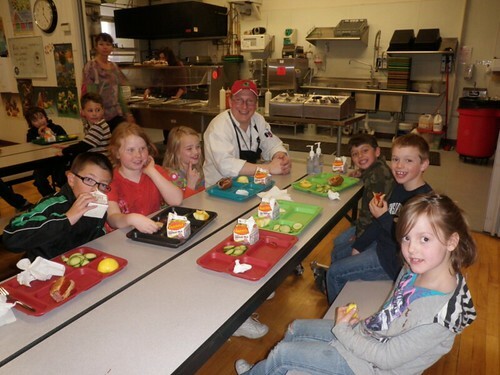 After they’ve finished playing at recess, students sit and eat their lunch with School Chef Jason Moore in Gallatin Gateway, MT. The following guest blog showcases Montana Team Nutrition and their excellent work implementing their Recess Before Lunch (RBL) program. Through this initiative Montana students enjoy active play right before indulging a nutritious school lunch meal allowing them to return to class ready for academic success. As USDA’s Team Nutrition celebrates its 20th anniversary, so does Montana Team Nutrition (MTTN)! Since 1995, MTTN has used funding from USDA to provide nutrition education and technical assistance to school districts across our state. Moreover, we’ve been innovators in our field, and one of our biggest accomplishments has been instituting a recess before lunch (RBL) culture in many of our schools. RBL is a school scheduling practice where students attend recess and participate in active play immediately before lunch. In 2002, MTTN began studying RBL with support from a local school principal at Whitefish Middle School, Mr. Kim Anderson. Mr. Anderson noticed that many students only spent 3 to 5 minutes eating their meals before dumping their trays and heading to recess. He knew it was hard to eat a balanced lunch meal during such short period of time, thus he welcomed working with MTTN in investigating how RBL, as opposed to recess after lunch, might impact student food consumption and food waste. With funds from a Team Nutrition Training grant, we conducted a pilot project in four elementary schools to assess how RBL impacted food waste. In addition to this study, we held focus groups with students to gain their perspective, and collected valuable feedback from school nutrition professionals and school administrators. An improvement in the mealtime atmosphere. Students had time to relax and enjoy their meals without rushing to get outside. While noise level in the cafeteria increased initially, once the students were used to the change, cafeterias became quieter. Administrators and teachers noticed that the students’ behavior improved in the afternoon. Students returned to class calm and ready to learn. Based on the pilot project’s results, we developed our Recess Before Lunch: A Guide for Success. Since its development, this guide has helped schools throughout Montana, as well as the U.S., change the traditional school schedule and implement RBL. Planning ahead and getting buy in and support from school staff. Involving students, parents and school staff in the planning process. Starting with a limited pilot program or trial period, monitoring and adjusting as needed. Because we recognized that our findings were relevant to others working in the field, we also published our results in the article “Scheduling Recess Before Lunch: Exploring the Benefits and Challenges in Montana Schools” which appeared in the fall 2010 issue of the Journal of Child Nutrition and Management. Currently, 33 percent of Montana elementary schools have RBL for all or some of their students. We are proud of this success and feel confident that RBL helps students eat better, waste less food, and behave better. For more information on this and other exciting projects being conducted by MTTN, contact us at 406-994-5641 or email kbark@mt.gov or stenberg@montana.edu.